We have a physical server running Windows Server 2008R2 with 6 NICs, 2 NICs for LAN (which will be teamed), and 4 NICs for iSCSI (which will each be configured with a different IP Address.) We need to configure the server to use Symantec Backup Exec 2012 SAN Transport Mode, to backup a VMware environment running off an EqualLogic PS6100 iSCSI SAN. 1. Install Symantec Backup Exec 2012. 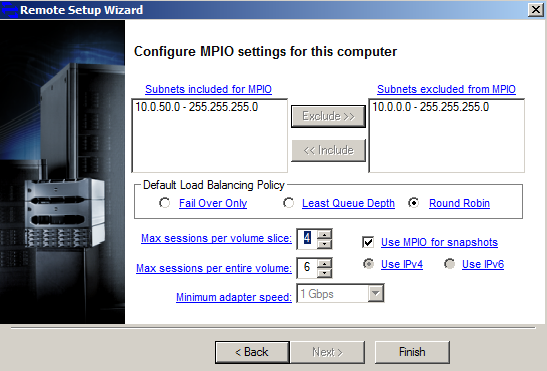 The HIT/ME installer will automatically add Server 2008 MultiPath I/O Feature, along with installing the EqualLogic MPIO DSM. 3. 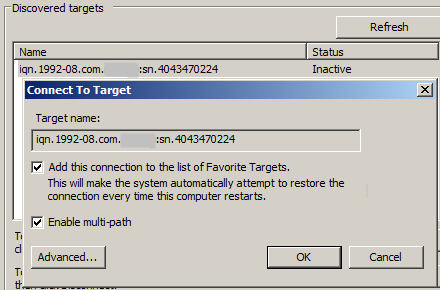 Reboot to complete the MultiPath I/O Feature install. 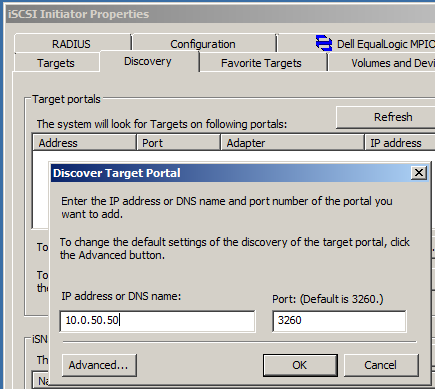 Note: If you check back 10 seconds or so later on the Properties or Devices… buttons there will be 4 Sessions/Devices present per target, with paths built by the Dell EqualLogic MPIO. Do this for however many disks you have. Note 1: The disk numbers match with the numbers in Disk Management, and they will indicate Read Only when the readonly attribute is set. Note 2: Setting the disks to readonly prevents accidental formatting/corruption, but also prevents restore to that volume. The volume can be set back to read/write with attributes disk clear readonly. Great stuff here. My name is Matt Stephenson and I am part of the Backp Exec Product Mgmt team. I have already scheduled a couple of your blogs about BE to go out via my Twitter feed as well as promoting it within Symantec to get the word out to a wider audience. Hit me up at @PackMatt73 via DM and I will forward you my contact info. Would love to hear more about your experience with BE, specifically with regards to VMware. I would also be happy to connect you with members of the development team if you have any questions. Thank you for the comment. I'm finding BE 2012 SP1 pretty simple and easy to use which is good. Any problems (not encountered any so far) I'll be sure to contact you. I'm currently not using the SAN transport because of the possibility of wiping out a VMFS datastore, just to risky trying to tell Windows to not do that. Problem now though is the VMware environment is to big for the NBD transport mode and it uses the VMware management network for the through host backups so can impact other things. This is the first time I have seen the ability to set the VMFS disks as Read Only, very interesting. I would think restores could use NBD transport so they wouldn't have to be changed back to Read Write. NBD is the only option for restores right now anyway with BE 2012. I have BE running on multiple Windows 2008 R2 with a number of iSCSI targets. Is there a way to get W2K8R2 to flag all of the iSCSI drives as read-only?